Drive up your music vibes with the Planet Audio Anarchy AC800.4 4-Channel Class A/B Full Range Amplifier. This powerful 2-Ohms stable Amplifier features 800 Watts Max Power with a MOSFET power supply for clean, strong sound. Customize the sound with Variable Low Pass Crossover, Fixed High Pass Crossover and Bass Boost. Bridge channels for more power and flexibility. The Anarchy Series of Amplifiers are built to break the rules, allowing you to customize and control your sound so you can live like a mobile anarchist, clear and loud. Revolutionize your audio experience with the Planet Audio AC800.4. For more product details, please scroll down. 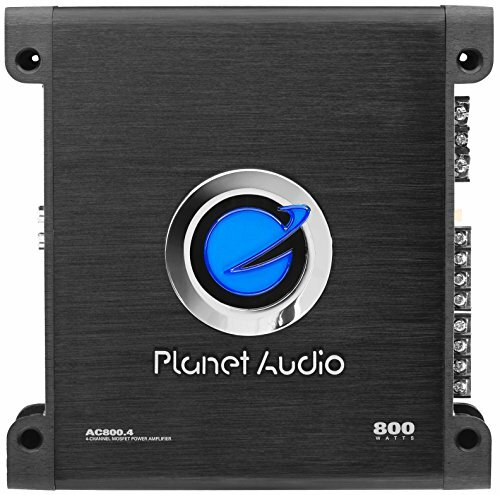 Dimensions: Depth 10" x Width 10" x Height 2.4"
If you have any questions about this product by Planet Audio, contact us by completing and submitting the form below. If you are looking for a specif part number, please include it with your message.